Lope de Vega (also Félix Lope de Vega Carpio or Lope Félix de Vega Carpio) (November 25, 1562 – August 27, 1635) was a playwright and poet of the Siglo de Oro, or Golden Age of Spanish literature. 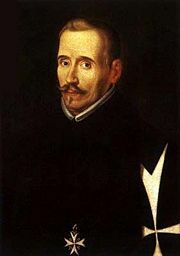 His reputation in the world of Spanish letters is second only to that of Miguel de Cervantes, while the sheer volume of his literary output is unequalled: he is estimated to have written between 1,500 and 2,500 fully-fledged plays—of which some 425 have survived until the modern day—together with a plethora of shorter dramatic and poetic works. In addition to his massive productivity, Vega is also notable for a number of radical innovations which he introduced to sixteenth-century drama. In the progression of literary history, Vega is most notable for his rejection of Classical dramatic forms. Vega argued that the function of any play is to please the audience, and he inspired a generation of Spanish playwrights to do away with the rigid conventions of Classical drama in favor of new, freer forms. Vega himself invented what is perhaps the most important form of all Spanish drama: the three-act comedia. In the world of Spanish literature, Vega's influence remains immense, and his contributions to the development of Western drama are significant. Lope de Vega was born in Madrid to a family of undistinguished origins. The first indications of young Lope's genius became apparent in his earliest years. At the age of five he was already reading Spanish and Latin; by his tenth birthday he was translating Latin verse, writing his first play when he was 12. His fourteenth year found him enrolled in the Colegio Imperial, a Jesuit school in Madrid, from which he absconded to take part in a military expedition in Portugal. Following that escapade, he had the good fortune of being taken into the protection of the Bishop of Ávila, who recognized the young man's talent and got him enrolled in the University of Alcalá de Henares. Following graduation Lope was planning to follow in his patron's footsteps and join the priesthood, but those plans were dashed when he fell in love, realizing that celibacy was not for him. In 1583 Lope enlisted in the army, seeing action with the Spanish Navy in the Azores. Following this he returned to Madrid and began his career as a playwright in earnest. He also began a love affair with Elena Osorio, an actress and the daughter of a leading theater owner. When, after some five years of this torrid affair, Elena spurned Lope in favor of another suitor, his vitriolic attacks on her and his family landed him in jail for libel and, ultimately, earned him the punishment of eight years' banishment from Castile. Vega went into exile undaunted, in the company of Isabel de Urbina, the daughter of a prominent advisor to the court of Philip II, whom he was subsequently forced to marry. A few weeks after their marriage, however, Vega signed up for another tour of duty with the Spanish navy; this was the summer of 1588, and the Spanish Armada was about to sail against England. Vega's luck again served him well, and his ship, the San Juan, was one of the few vessels to make it home to Spanish harbors in the aftermath of the disastrous expedition. Back in Spain, he settled in the city of Valencia to live out the remainder of his exile and to recommence, as prolifically as ever, his career as a dramatist. In 1595, following Isabel's death, he returned to Madrid and promptly remarried. The first decade of the 1600s were the years when Vega's literary output reached it peak. He was also employed as a secretary, but not without various additional duties, by the Duke of Sessa. Once that decade was over, however, his personal situation took a turn for the worse. His favorite son, Carlos Félix, died and, in 1612, his second wife Juana herself died during childbirth. Deeply affected, Lope gathered his surviving children from both unions together under one roof, piously devoting himself to Christianity. His writing in the early 1610s also assumed heavier religious influences and, in 1614, he joined the priesthood. The taking of holy orders did not, however, impede his notorious romantic dalliances, although the duke, his employer who was fearful of losing his secretary, played a role in this by supplying him with various female companions. In 1635, Vega faced a series of tragedies, losing his son Lope, a worthy poet in his own right, in a shipwreck off the coast of Venezuela, and the abduction and subsequent abandonment of his beloved youngest daughter, Antonia. Stricken with grief, Lope de Vega took to his bed and died, in Madrid, on August 27, 1635. A rapid survey of Lope's nondramatic works begin with those published in Spain under the title Obras Sueltas (Madrid, 21 vols., 1776-79). The more important elements of this collection include the following: La Arcadia (1598), a pastoral romance, is one of the poet's most wearisome and derivative early works; La Dragontea (1598) is a fantastic history in verse of Sir Francis Drake's last expedition and death; El Isidro (1599) is a narrative of the life of St. Isidro, patron of Madrid, composed in ottava rima; La Hermosura de Angélica (1602), in three books, is a sort of continuation of Ariosto's Orlando Furioso. Although he is best known to this day as a playwright, Lope de Vega was also one of the greatest Spanish poets of his time, alongside Luis de Góngora and Francisco de Quevedo. In the 1580s and 1590s his poems of sentimentally rich pastoral themes were extremely popular, in part because Vega—who appeared in his poems under a variety of pseudonyms—portrayed autobiographical elements of his own love affairs. Among his more popular works of poetry are sequences of love sonnets La Hermosura de Angélica and Rimas, as well as the religious sonnets collected in a book entitled Rimas sacras, which was a huge bestseller in its time. Finally, in 1634 just prior to his death, Vega published a third book of short poems, Rimas humanas y divinas del licenciado Tomé de Burguillos, which is considered his masterpiece and one of the most daring and original volumes of poetry written in the seventeenth century. In Rimas humanas, Vega assumed the identity of Tomé de Burguillos, a poor scholar whose deep romantic passions for a maid named Juana are in direct conflict with his academically cynical outlook on life. Although his poetry is of great value, it is ultimately to his dramatic writings that Lope de Vega owes his prominent place in literary history. It is ironic then that he always treated the art of comedy-writing as one of the humblest of trades. Vega himself frequently protested that he wrote his plays purely out of financial need, and that they should not be judged as works of high art. Yet, despite his extreme humility on the matter, it is an undisputed fact that Spanish drama, if not literally the creation of Vega, at least owes him its definitive form: the three-act comedia. In his famous essay Arte nuevo de hacer comedias en este tiempo (1609)—his artistic manifesto which includes his justification for the Classical traditions of drama – Vega begins by showing that he knows as well as anyone the established rules of poetry, and then excuses himself for his inability to follow them on the ground that the "vulgar" Spaniard cares nothing about them, concluding ironically, "Let us then speak to him in the language of fools, since it is he who pays us." Lope de Vega belonged in literature to what was referred to informally in the Siglo de Oro as the School of Good Sense: he boasted that he was a vulgar Spaniard, steadfastly maintaining that a writer's business is to write so as to make himself understood and taking the position of a defender of the language of ordinary life. Ironically, the most frequent criticism leveled at Vega's plays today is their excessively complex phraseology and language—despite his desire to write in the language of ordinary men, Vega was a well-educated member of the gentry, and his writing suffers from the ornate and overwrought style of verse that had become very popular during the Siglo de Oro. In spite of some discrepancies in the figures, Lope's own records indicate that by 1604 he had composed, in round numbers, as many as 230 three-act plays (comedias). The figure had risen to 483 by 1609, to 800 by 1618, to 1,000 by 1620, and to 1,500 by 1632. 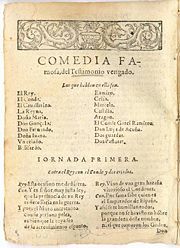 Montalbán, in his Fama Póstuma (1636) set down the total of Lope's dramatic productions at 1,800 comedias and more than 400 shorter sacramental plays. Of these 637 plays are known to us by their titles, but the texts of only some 450 are extant. Many of these pieces were printed during Lope's lifetime, either in compilations of works by various authors or as separate issues by booksellers who surreptitiously bought manuscripts from the actors or had the unpublished comedy written down from memory by persons they sent to attend the first presentation. Therefore such pieces that do not figure in the collections published under Lope's own direction—or under that of his friends—cannot be regarded as perfectly authentic, and it would be unfair to hold their author responsible for all the faults and defects they exhibit. The classification of this enormous mass of dramatic literature is a task of great difficulty. The traditional classifications of tragedy, comedy, and romance do not apply to Lope de Vega's oeuvre. In the first place, his work essentially belongs to the drama of intrigue, in a genre often referred to as capa y espada or "cloak and sword" dramas, where the plots are almost always love intrigues complicated with affairs of honor, most commonly involving the petty nobility of medieval Spain. Among the best known works of this class are El perro del hortelano ("The Dog in the Manger"), La viuda de Valencia ("The Widow from Valencia"), and El maestro de danzar. In some of these plays Vega strives to set forth some moral maxim and to illustrate its abuse by a living example: thus, on the theme of poverty, we have the play entitled Las Flores de Don Juan. Here, he uses the history of two brothers, one wealthy and corrupted, the other poor and virtuous, to illustrate the triumph of virtue over vice. Such morality pieces are, however, rare in Lope's repertory; generally, his sole aim is to amuse and stir his public, without lingering on didactic moralizing. His genius as a playwright lies in his masterful handling of plot and character, rather than in his selection of themes. Lope de Vega is widely considered to be responsible for reforming Spanish drama outright. Prior to him, the composition of Spanish plays was highly irregular, both in structure of the play and the actual meter and versification. Vega adopted this loose, unregulated style of poetry, but expanded its literary power to extraordinary degree, introducing everything that could possibly furnish material for dramatic situations, including stories drawn from the Bible, from ancient mythology, from the lives of the saints, from ancient history, from Spanish history, from the legends of the Middle Ages, to the current events and everyday life of Spaniards in the seventeenth century. Prior to Vega, playwrights barely sketched the conditions of persons and their characters; with fuller observation and more careful description, Lope de Vega created real types and fully three-dimensional characters that would influence generations of subsequent Spanish drama. Ibanez, Maria Azucena Penas. Lope de Vega: Edicion y Estudio. Madrid: Eneida, 2004. History of "Lope de Vega"
This page was last modified on 4 April 2008, at 02:13.